5 Sweet, Sweet, Texas Stars! I've loved every book in this series and didn't want it to ever end, but Candis Terry did the Wilder family proud with this final story. I laughed, I sighed, I fanned myself, and I cried, and I will miss the people and the town of Sweet, Texas! 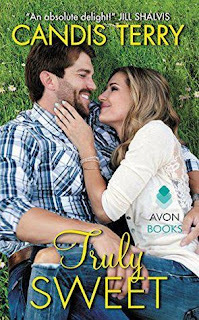 At sixteen, Annabelle Morgan hoped her crush on Jake Wilder was just a passing phase. Now she s twenty-nine and nothing has changed except Jake. The once-carefree marine has come home with a giant chip on his shoulder. He insists a single mom like Annie deserves more than he can offer. Yet no matter how gruff his gorgeous exterior may be, Jake s toe-curling kisses convince her that this attraction is definitely mutual. Butting heads with feisty Annie was always a thrill. Add other body parts to the mix, and Jake is in serious trouble. He can t be a forever-and-family guy and Annie s not a friends-with-benefits kind of woman. But love has a way of changing the best-laid plans, and surrender has never been so tempting. An ARC of Truly Sweet was provided by Avon Books, and in appreciation I'm giving them an honest review!